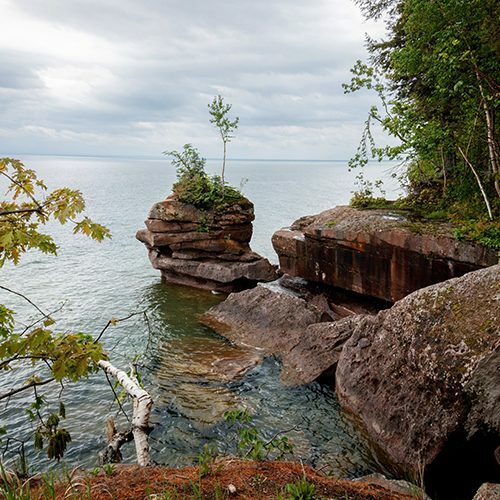 Get away, embrace island time, and reconnect with nature by visiting Madeline Island—the largest Apostle Island in one of the most progressive corners of Wisconsin. Boarding the ferry in Bayfield, the Ojibwe word nagadan or “to leave behind” was my mantra for the weekend. For a long time, Madeline Island was considered the spiritual center of the Ojibwe, and it’s easy to see why. From the moment the ferry departs, you can feel it transporting you to another world. By the time you arrive in La Pointe, you’re already noticeably more relaxed. The very small-town life here is welcoming you, and the miles of sparsely populated forests and lakeshore invite you to explore them at your own pace. Madeline Island’s perfect mix of Wisconsin’s “Up north” state-of-mind and geography can be found across its 14 miles of wooded forest. Lakefront cabins are tucked back off the road and hidden by the woods, all offering you a piece of their “superior life.” There’s also dozens of campsites in both Big Bay State Park and the local Town Park. If you’re in search of solitude and a beach, I strongly recommend following the boardwalk from Town Park to a 1.5-mile stretch of beach, and further beyond to more than seven miles of hiking trails. Madeline Island first caught my attention after the 2010 census. For the first time in history the census allowed you to indicate the gender of your spouse, so there was a campaign for LGBTQ-identified folx in committed relationships to “queer the census.” What came of it was a first-of-its-kind map showing where we live. As expected, per capita Dane and Milwaukee counties were well represented. Ranking just as high though was Ashland County at nearly 8%, home to Madeline Island. 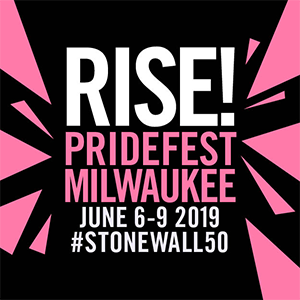 As it turns out, this northernmost part of Wisconsin is home to not only a progressive community, but a thriving LGBTQ one as well. While touring La Pointe I felt at home by the number of LGBTQ-owned businesses, Pride window clings, and bumper stickers I saw. If you’re looking to create your own signature Wisconsin vacation, or just a quick getaway, I’ve listed some of my tips and recommendations below so you can make the most of your own time on Madeline Island, too. For me, it was one of the best vacations I’ve had in our state, and I am already daydreaming about how soon I can go back. The Madeline Island Ferry (madferry.com) is the main way visitors arrive, and can accommodate passenger, bicycle, and car transportation. It departs regularly from Bayfield to La Pointe. The cost is $7 per person, and $12 per auto. Last-minute lodging on the island isn’t impossible but can be challenging. It is best to book your vacation home or campsite far in advance. 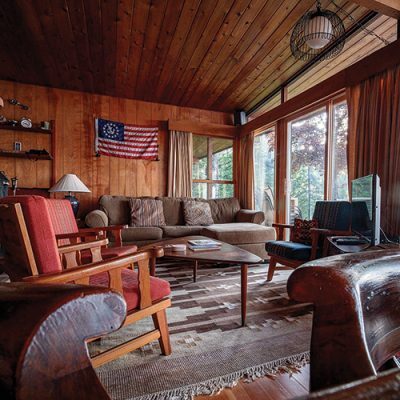 There’s something for everyone, from secluded cabins on the lake, to condos in the center of town, to park campsites. 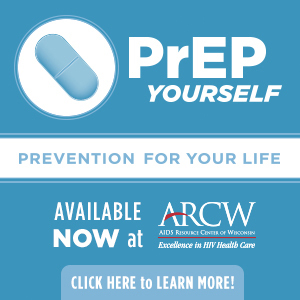 For local help with rentals, I highly recommend connecting with the LGBT-owned Madeline Island Vacations (madelineislandvacations.com). Owners Mike Rasmus, Dave Johnson & Ron Madich share over 50 years in the motel, vacation, and hospitality industry and have trusted relationships with dozens of local properties and homeowners. If camping is more your style, you’ll need to reserve your spot at wisconsinstateparks.com. There’s a lot to see and do on this small island (a population of just 302), and even more if you can get out on the water to explore the surrounding Apostle Islands. Adventure Vacations (adv-vac.com), in the center of La Pointe, is a great place to base your exploring from. They offer boat and kayak tours, hiking tours, and gear rentals ranging from stand-up paddle boards to wetsuits and other water gear. If you just want to hop on a moped or bike and explore the island by land, you can rent either just across the street at Motion to Go (motion-to-go.com). Besides the rentals themselves, Motion to Go also has a series of maps on site that you can take to help plan your route. The Madeline Island Museum (madelineislandmuseum.wisconsinhistory.org) is a must-visit while you’re there. It’s part of the Wisconsin Historical Society and can walk you through 300 years of island history, from Ojibwe lifeways to the fur trade. Plus, the museum’s store features books, handmade jewelry, Ojibwe crafts, and other gifts. Madeline Island Candles (madelineislandcandles.com): This LGBT-owned boutique offers everything from soy to beeswax candles, and a new candle line made from essential oils. It also has a list of unique accessories and specialty soaps, too. An unexpected bestseller: soap on a rope—because of how common outdoor showers are on the island. Bell Street Gallery (bellstgallery.com): This local gallery features artwork from 40+ local artists, an open-air pottery garden, and an Art Bar that hosts live music several nights a week, June through September. Dockside Gifts (docksidegifts.com): An LGBT-owned gift store located right next to the ferry terminal that offers items for your home. They carry a mix of metal art, kitchen items, apparel, and more. Q&Z’s Bakery & Cafe is the newest business on the island, and a great spot to get a breakfast pastry. I highly recommend the rhubarb muffins. Rumor has it that they’re the best in town. 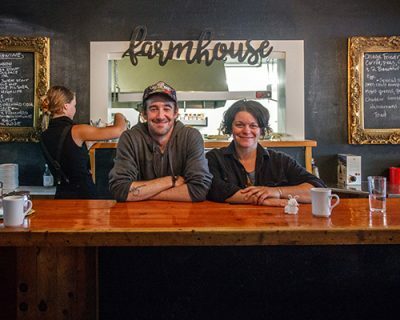 Another fantastic breakfast or brunch spot is Farmhouse (farmhousemadelineisland.com). Owners Lauren Schuppe and Gip Matthews have a talent for mixing style with a discerning approach to their farm-to-table menu. They’re even working to add their own farm to expand what they can source directly from the island. Fun fact: Lauren is also the town’s librarian. Plan to do dinner at Café Seiche (cafeseiche.com). This LGBTQ-owned restaurant has the best menu on the island, from grilled beef tenderloin to pepito crusted whitefish—usually caught the same day when in season. And for vegetarians, you’ll find options with your name on them, too. Tom’s Burned Down Café (tomsburneddowncafe.com) may have been the most unexpected highlight of my trip. The best way I can describe it is if an eclectic, artsy junkyard could double as a neighborhood dive bar. The vibe is relaxed and social, and you can tell its patrons take pride in how unique and one-of-a-kind it is. Definitely make a point to stop in, if just to take in the décor.